The Play Sports! series combines sports subjects with contemporary relationship themes and relatable family issues. 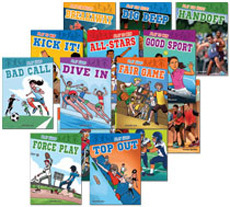 Each set focuses on five different sports, and features the same characters in each set.Each level progresses with slightly more complex sentences and vocabulary. Choose a reading level (1, 2 or 3) that's appropriate for your struggling reader. When your student has completed Play Hard (Level 1) or Play to Win (Level 2), they can always 'Read Up' to the next higher reading level.